Finally, we're underway on the grass in Halle at the Gerry Weber Open and I'm glad that we get to watch tennis on a surface that for once isn't clay. It feels like the clay season drags on forever and the grass is more than a welcome change. 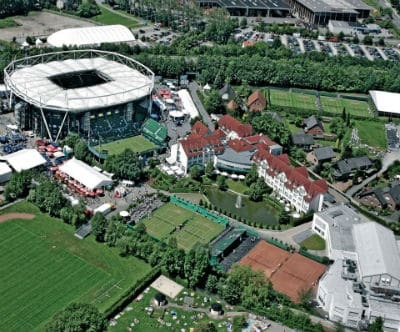 Halle looks like such a cool place too and I don't think the TV cameras do it justice, it often looks pitch black on TV but I think watching from the stands would be an experience that you can't get elsewhere. It's a weird shape stadium, the court looks small and it all looks very crammed in and cozy and that's why I like it. Moving on to todays match we saw Roger take on German Florian Mayer, a tricky first match on grass against a guy who knows how to play on the surface and was coming off a tournament win in the Czech Republic albeit on Clay. Roger played a pretty good match today, it was steady, he didn't lose serve (saving the 1 break point he faced), hit 11 aces, won 76 per cent of his service points and converted two of his six break points so really a solid performance. Like I said, Mayer is tricky, unorthodox in technique but effective so could have easily taken a set off Roger or even caused on upset so coming through unscathed was a promising start. There's nothing else to say really, Roger hit some sweet backhands, used his slice effectively and as usual was just that bit too good for his lower ranked opponent. There were a few errors but you're always going to make more of those on grass than other surfaces so I have no complaints. I'm very happy with the way things went today. I obviously knew playing against Mayer in the first round was going to be tricky, Federer said. He's in the Top 30 and has been to the quarter-finals of Wimbledon. And I've played him here on grass before, so I know how tough he can be. But I felt I was focussed, was moving well and bascially, didn't have any letdowns on my serve. I was able to create a few more chances than he did. I'm through with my first victory on grass this year and I hope it's not my last. Potentially a very tricky match for Roger here against big serving Raonic. It's essential Roger returns well as it's possible Raonic could serve through the court on a quick surface like Halle. I expect to see at least 1 tie break and imagine it will be a very close match. If Roger can get into some rallies I fancy his chances and providing he doesn't lose serve easily (1 break for either player will virtually be set over) then he should prevail. There's also a possibility of a Fedal final Halle. Nadal won easily today and is clearly in a crazy confident state of mind right now, I think he's going to be tough to beat even on grass and it'd be ideal if Roger could derail him prior to Wimbledon. – So many great points, I agree with you with the backhand winners. SO-SWEET. – I think the match vs Raonic could easily be the most difficult one. But i’m glad Fed faces a big server so soon, it’s the best training for Wimbledon. – I actually don’t think Rafa would reach the final, but I admit a Fedal final here would be SWEEET. Yeah the first match on grass after clay is always tricky I imagine so Fed did will to come through without too much trouble. You reckon Nadal will lose? I feel like he’s like a runaway train after winning Paris so he could easily take down Halle. It’d be bad if he were to beat Roger here because then he’d be firm favourite for Wimbledon. But there’s still a few matches before we have to think of the Fedal final. I’m pretty sure Rafa wont make the final, don’t ask me why, but I think he deserves a rest (and this is coming from a Rafa-Disliker-but-respecter). I think he’d have troubles beating Kohly and even more vs Haas/Berdych. And, in case of a Fedal final, i’m pretty confident, and another victory over Rafito would be so sweeeeet. Perhaps you’re right! We’ll see. I’d like to see Kohly beat him though, it’d be a win for tennis. Would you make a grass tournament a Masters 1000? He would have at least five more Masters titles. Yeah that’s true! It’s weird how grass doesn’t have one, it was the most common surface at one point at 3 slams so how it’s gone into relative obscurity is weird. Regarding your last question. A big YES to a grass Masters 1000. But the grass season is so short they’d have to move Wimbledon to July, and I don’t think they’d do that. But yeah, no doubts about it, a pretty nice grass M1000 by the end of June, right in the moment of Wimbledon. It’d be amazing… Specially if it is fast-grass. Yeah I think the crowds would enjoy it more than a bog standard clay event like in Rome or Monte Carlo. Loadsa players skip MC so it’s clearly not a tournament dear to anyones heart. Nice venue, cool place but nothing unique about it. I’m thinking maybe convert both Halle and Queens to 1000s, shuffle the scheduling a little round, and do away with Rome and Shanghai (which is obviously towards the end of the year; the calendar can just be adjusted by a one week shift). Queens should become a M1000, but I don’t know if it’s fair that the M1000 and the GS are played on the same country. That’s why if I have to pick one, it would be Halle!!!!! True, but there’s a big difference in that the US is a massive country and so is relatively justified in having several high-profile events spread across it, while Britain is a much smaller one with both Queens and Wimbledon being in London, so they will both have basically the same live viewing audience. Hey Jonathan! Nice write. I have the same feelings as you at the moment on Halle. I really had a great feeling for Roger coming into this tournament, but again he’s thrown Raonic for the next round who’s a potential threat, and then of course if he makes it through that round, there’s Nadal, and he’s looking good at the moment. But at the same time, I’m not going to be complaining about the draw because ideally, the winner of the tournament should be able to beat all players playing. I also think they could convert Queens to a Masters 1000. I mean, to me it just sounds ideal because it would bring all the players to London sooner, and it would be a nice 2 weeks to prepare for Wimby. But at the same time, if this were a Masters 1000, Wimby would be right around the corner, and I have a feeling most players might skip it? I don’t know. ATP needs to fix some of the scheduling. I mean, Nadal is really on a great run, but after the finals on CLAY at the FO, and now he’s here in Halle on GRASS? That’s such a quick change, and if he wins Halle, he’s got to be a major threat in Wimby. However, considering all the tennis he’s been playing (and even though he’s been dominant the whole way through and the streak is mostly from clay) if he and Roger make it to the finals, I have a feeling it might be like an IW semi replay? Yeah I think Halle is important for Roger to win to give him confidence heading into Wimbledon. If he can return serve well then I’m sure he should be able to not get broken himself and 1 break a set should be enough. I’d like a 1000 on grass too, I wonder if Queens is big enough to handle it, but it’d be good to see. They’d have to ditch a clay event and move the French a week or 2 weeks earlier or something. Hope you’re right on the Indian Wells replay if they meet in the final. Haha I thought you were predicting the final should Fedal meet 😉 but I’m chuffed Kohly won. I would make Halle a M 1000 since it’s the only other warm-up event (other than Queen’s)before the Wimbledon.. In the process, I would drop Monte-carlo or Rome Masters, since there’s already Madrid Masters as warm-up for the French Open.. It’s disgusting you have 3 M 1000 (Rome, Monte-Carlo & Madrid) and 1 M 500 (Barcelona) back-to-back before the French Open, the reason for Nadal’s success on clay and just 2 grass events, that too 250.. If there was a single M 1000 grass event, Federer would have more Masters titles than Nadal, for sure.. Doesn’t matter, he has far more Wimbledon titles than Nadal..
Yeah there is far too many clay events! It should be more even across all 4 surfaces. Ever try telling that to Nadal? “Too many Clay events! ” 🙂 He wants more on Clay in place of hard. Uncle Tony would be flipping out. Calling every member of the ATP a puta. I would get rid of MC as a 1000 event. Too many 1000’s on clay. I would have Halle or Queens as a 1000 event. The problem is Roger is committed to Halle until retirement. Grass is so much more interesting to watch. I’m so sick of clay! There should definitely be a Master 1000’s on grass, I think they should take one out on clay, and switch one up with grass. Since Roger doesn’t really like Monte Carlo, I would get rid of that as a 1000 event and move it to Halle- since Roger is signed a contract to participate in Halle until Retirement. Yeah I think Monte Carlo is best choice too, it’s non mandatory anyway so switching it to a grass event makes perfect sense. One masters on grass? What about total equality. There are nine masters. 3 on hard, 3 on clay and 3 on grass. And I don’t mean this new weird grass of the last 10 or so years that plays like a fast-ish hard court. I mean the fast traditional type of grass. It would help revive old ways of playing the game and would create more intrigue in the switch between clay and grass. I mean Borg won 6 French and 5 Wimbledons often winning them back-to-back. And that was in the late 70s/early 80s when clay was really slow and grass was really fast. It took a super player to adapt his game to both. The way the game is now is kinda boring. The same players get through to the final rounds playing the same way they play at any tournament. Judging by what happened in Madrid and Federer’s success on the faster indoor courts I believe he is the only one of the big 3 capable of adapting his game to both. Variety is the spice of life. And tennis too. That would be nice man! Wonder how long you would have to protest outside the ATP offices to make it happen? haha. It would definitely make the tour more interesting and we’d find out more about the players and how their game stacks up on surfaces that all play very differently. Of course all the grinders would hate the idea. It’s all too homogeneous, Miami plays like clay, Aus is slower, they made US slower last year. And even when they change it like in Madrid to make it interesting the players complain. Very true indeed. To be honest I could write a whole article, hell even a novel, on this subject alone. It has really annoyed me over the years. Yeah some Fans expect too much because they’ve been spoiled over the years watching Fed. But even in his prime his lost matches like the Haas one so it’s nothing to worry about.